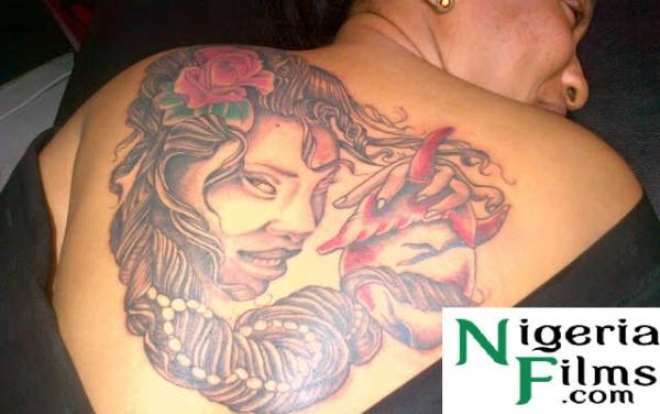 Rukky Sanda's Back Tattoo; An Attempt To Be Like Tonto Dikeh? When in 2011, at about this time of the year, Tonto Dikeh had that huge controversial tattoo on her back, she became a big news item for national dailies, soft-sell magazines and online journals. For weeks, Tonto made various headlines with the tattoo. Rukky Sanda and Tonto Dikeh are very close friends who do things together. For Rukky, though a media frenzy freak, she has still not got the special publicity stunt Tonto has. Just recently, Rukky posted on a popular photo sharing platform 'Instagram' a picture of her back with tattoos. Unfortunately, the picture has not created much buzz as expected as the one Tonto's created. Some have pondered if Rukky is trying to be like her friend, Tonto. But for now, she has succeeded in getting a bit of publicity from the media concerning her tattoo. As it stands, Tonto still has the record. Popular Nollywood Actor, Kenneth Okonkwo Dumps Acting For Evangelism?